Female reporters, war coverage, and Ernest Hemingway: Re-Defining a woman’s work. Italian war correspondent Francesca Borri. Photo: Alessio Romenzi via Pressenza. Recently, I came across the most moving account of the war in Syria I’ve ever read. Its author wasn’t an analyst, or a fighter, or even an aid worker. No, the writer was Francesca Borri, an Italian freelance journalist currently in Aleppo, covering the conflict for a newspaper back home. Borri’s piece appeared in the Columbia Journalism Review and details how she endured being shot in the knee and survived typhoid fever to earn just $70 per article. She also explains how her editors in Italy are only interested in pieces that portray Syria as a bloodbath, with no nuance or understanding of the forces that created the conflict in the first place. “Every torn-apart child we see, they come only to me, a ‘fragile’ female, and want to know how I am. And I am tempted to reply: I am as you are,” she continues. I read this paragraph out loud during the launch of a report on the status of women in Pakistan’s media. Called “Who’s Telling Our Story” the panel discussion at the launch encompassed many of the problems Pakistani women face when trying to enter the field of media and journalism. 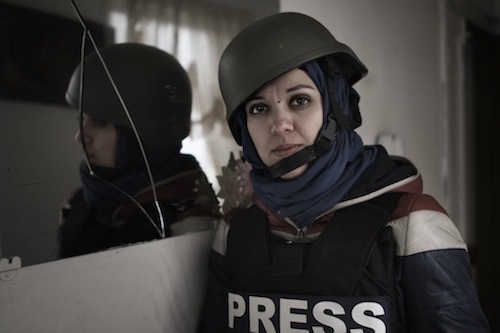 The most challenging obstacle: Fears surrounding the safety of female reporters, especially those reporting from conflict zones and the sites of bomb blasts. I read Borri’s words to show the audience that women are fully capable of operating under the same conditions as men, and that war psychologically damages men and women in the same way. Conservative Pakistanis want to shield their daughters from this kind of trauma, and even I agree that Borri sounds more than a little unhinged from her experiences, but nobody is protecting the ordinary women who are raped, tortured, blown up, or shot in Syria or in Pakistan anyway. I’ve always found it heavily ironic that people use the first sentence as an inspirational quote, ignoring the rest of the paragraph’s bleak observation about the nature of war and of life itself. On the other hand, the editors of Borri’s newspaper want only the stories that portray the conflict in Syria as a bloodbath, and choose to ignore anything that does not fit that frame. Perhaps it’s the work of exceptional women and men who are reporting on conflicts to tell the whole truth about what they see, even if it breaks them, or kills them in the end.